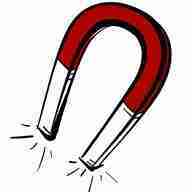 Magnets have a special power that enables them to attract other magnetic things such as iron, steel, cobalt and nickel. Magnets have two main forces - push and pull. As you will see from these magnetic experiments, magnetism (the invisible force) can push and pull through some materials such as paper and plastic. Paper clips are made of steel. If you hold a paper clip close to a magnet, you can feel the magnet pulling on the paper clip with an invisible force called magnetism. All magnets have two ends or poles (North & South). If you put the poles of two magnets together, they will either pull together or push apart. They will pull (attract) each other if the poles are different. They will push (repel) each other if the poles are the same. Experiments with magnets will help you to find out more about the way magnetism works and how it can be passed on to some other objects. Look for magnets in old toys or on fridge stickers, or buy a bar or horseshoe magnet from a toy shop. Pulling and Pushing Opposites attract? Suspended Paper Clip Magic floating paper clip!